The picture does not do it justice, this turned out to be a really good. My husband was definitely a fan. 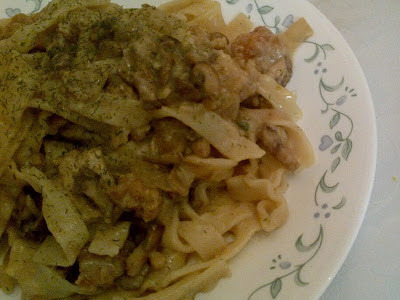 I wanted to make something similar to a beef stroganoff we used to make with mushroom soup. Mushroom soup is not vegan so I substituted this with a mushroom "cream" sauce. I decided to cut up meatless chicken strips instead of using fake beef because I don't like fake beef but you could substitute it in if you prefer. Meatless chicken breast would be better but it was sold out. I get the President's Choice brand from the frozen meat section because it is priced much better than other brands and it tastes good. Bake the "chicken" according to package directions. Add oil and flour to a small sauce pan, heat on medium and stir. Add 1/2 stock cube and combine. Slowly add the soy milk a little at a time. Stir well each time to avoid lumps. Continue to stir until thick then remove from heat. Add 3 T oil to a walk and heat on medium-high heat. Add onion and saute until limp. Add garlic, stir until browned. Add mushrooms and a pinch of salt. Once the mushrooms have reduced in size, add cream sauce, sage, salt, pepper, a squirt of lemon juice and the pasta water. Remove from heat. Chop up "chicken". Mix pasta and chicken into the sauce and serve. A sprinkle of dill over the dish serves as both a garnish and adds a nice flavour. Enjoy!